Outside, the sun was just rising. Everything was cast in a rosy, golden glow and for once, the streets of Neopia Central looked peaceful and quiet, like a little suburb tucked into a web of streets and buildings. In a few hours, Neopians would begin crowding these streets, going about their business, talking, laughing, flying, slithering, dragging petpets and petpetpets and tossing their unwanted things to the Money Tree. But right now, only a few early bids strolled about, and there was a peaceful quiet in the air. Cate sipped her banana cream coffee as she sat by the window and looked outside. 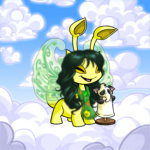 This has been her favorite coffee shop when she lived in Neopia Central, but it had been years since she had last come here. Still, it reassured her that they still had her favorite drink—this hadn't changed in all that time. Many other things had. "Yes. What about you? Do you travel much?" The sound of his hearty laugh comforted Cate. It sounded carefree and generous, a type of laughter that one didn't see much traveling. "No, no. I haven't left Neopia Central in years." He smiled. "I've always wanted to, but whenever the time comes, I find that I can never get the first foot out the door. But I love hearing stories, if you've got any." "Yeah! You know, meeting bandits on the road, escapes from danger, that sort of stuff! Exciting things are bound to happen to you when you travel—not all roads are safe, as I'm sure you know." The Gnorbu leaned closer. "So, got any good stories?" Bandits, escapes, danger... Cate's life was full of such stories. But today she didn't feel like sharing. Today, all those stories didn't seem exciting, just lonely and restless. She took another sip of her coffee, to avoid looking at the Gnorbu who was still looking at her expectantly. "You know," the Gnorbu said gently, as if he could read her mind. "You don't have to share if you don't want. I just thought I'd keep you some company—you looked kind of lonely over here." Cate looked up, surprised. "Did I?" She was disappointed—she always tried hard not to show such feelings. It only brought others down and never did her any good. 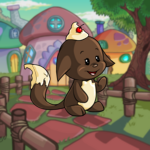 "Well..." The chocolate Kacheek hesitated, but the Gnorbu seemed kind. She plunged forward, "I'm going to live with my new owner today, and I guess I'm a little nervous." The Gnorbu nodded. "That's understandable." "And..." Cate didn't really know how she felt. She just felt down, but didn't understand why. "I don't know. I think I'm a little tired of traveling so much too." "When's the last time you went home?" Cate smiled and shook her head. "I can't remember. I stay on the road mostly. I'm a little footloose." "A little?" The Gnorbu looked down at her suitcase. "That bag says you've been on the road a long time. You're a right old wanderer, I'd say." Wanderer. The Gnorbu was right—hadn't she herself used that very word to describe herself before? But today, the sound of it made her uncomfortable and tired. She suddenly just wanted to rest, to lie and sleep for a long time. Perhaps it was a good thing that she'd been adopted. Maybe she could spend some time at a regular neohome before running back out there. "Are you staying in Neopia Central for long?" the Gnorbu asked. She began shaking her head, then paused. "Well, I have plans with a friend to travel to the Lost Desert, but I may postpone those." "You should. I think you need a little time at home. Get to know your new family. Have you met your owner before?" Cate nodded. "We talked, briefly." The Gnorbu smiled. "Everything will be alright, you'll see." It was so strange to hear those familiar words coming out of someone else's mouth. It was practically her catch phrase; how many times, when cramped and scared and lost had she spoken those words, comforted and soothed and encouraged? Cate smiled. "Thanks for the pep talk. I'm Cate, by the way." She held out a dark, smooth paw. "I'm Liam. Pleased to meet you." He smiled. "I probably should get going, but the best of luck to you. Be safe in your travels." With that, the Gnorbu took his half eaten scone and trotted off. Cate watched as he hurried down the street and into an unopened shop. His company had both wearied and comforted her, and he reminded her of a friend she had almost forgotten. He too had always been able to tell when she was down, and had always offered wise advice. Cate lingered until the last of her coffee was quite cold. She finished it, though by now it was almost too sweet, and left the coffee shop, ready to meet her new family. She knew that her new owner also had two other pets, but Cate had no idea what they were like. The neohome was a small cottage-like house with a large front yard. There stood a small white shed next to it, and a pretty stone path leading up to the large round door. The door was strange--Cate had never seen a round door in all her travels. Her new owner answered the door. The girl looked briefly surprised before a smile broke over her face. She yelled, "Cate!" and pulled the Kacheek into a hug Cate wasn't expecting. Cate couldn't help laughing—it was such a friendly welcome, and travelers were not often welcomed quite so kindly. "I wasn't expecting you until noon, at least," Jenny said. "But we have breakfast ready, if you haven't eaten yet. Nelly and Des are late risers." Nelly and Des. They must be her new siblings. Cate followed Jenny into the cozy house. "You have a very interesting door," Cate commented. Jenny laughed. "It was inspired off a book I read. Silly idea, since it was a nightmare to make and fit. Well, here comes Des. You can always tell because he keeps bumping into the walls. He was just painted and he's not quite coordinated yet." A baby Lupe shot out from the hallway. "Are you Cate?" He ran over to her, grinning. "You'll have to lean down to shake my paw, sorry, but it's very nice to meet you!" Cate smiled as she knelt and shook Des's tiny paw. "You'll have to wait to meet Nelly—she's still sleeping." Des rolled his eyes. "But boy! We've got the guest room all ready for you and—"
Jenny interrupted, "I know you like to travel, so I wasn't sure how long you wanted to stay with us. We're not having guests over anytime soon, so that room's pretty much yours, however long you want to stay." Cate glanced down at the excited baby Lupe and at the smiling owner. "I don't think I'll be leaving soon," she said. "I'm a little travel weary, and..." She smiled. "I'd like to be home for a while."